When we talk about shoes and how to buy them advices on the cheapest pairs, fashion trends and all beautiful things regarding shoes, we didn´t stop just for one moment to think about our feet. How do they will feel inside the shoes and problems that this shoes will cause eventually. Well . . . this post was written for all those people that has or have been through any of these diseases and don´t want to be a part of them any more. Athlete’s foot is a parasitic fungal infection of the epidermis of the human foot. It affects mostly men and young people attacking the area between the toes, soles of feet fingernails and toenails, but in severely lasting cases may appear as an extensive pattern on the bottom and sides of the foot. Tinea pedis (athlete´s foot) is estimated to be the second most common skin disease in the United States, after acne. Up to 15% of the U.S. population may have tinea pedis. The fungus is very contagious and is transmitted by coming into contact with wet floors, or by touching infected shoes or socks. If the dead skin is infected with the athlete’s foot fungus and someone else walks along the area where this dead skin is, it could stick to their feet and consequently infect the person with the fungus. A burning sensation between toes, itching, redness, scaling, blistering, are the most common symptoms when looking for athlete´s foot disease. – Wash your feet every day, paying special attention to the area between the toes. – Wear sandals or flip flops in public places. – Dry your feet very carefully, again particularly the area between the toes. – Keep the toenails cut short and straight across. – Dust an anti-fungal powder on your feet and into your shoes. – Never use plastic shoes, your feet needs to breathe. – Wear your shoes in rotation. – Wear cotton socks, or special running socks which absorb sweat and change these socks frequently and always put on clean ones after washing your feet. – Avoid tight, closed in footwear especially in the summer open shoes let the feet breath. Commonly appears on such areas of the feet as the soles and heels. Dry skin can result from a variety of reasons: commonly age, using air conditioning systems that keep the air dry in our offices and houses, long and hot showers bath, WHAT?? Yes, prolonged exposure to hot water can wash away the natural oils that protect your skin. Soap is another common problem, believe it or not, soap can quickly strip away your skin’s protective oils, and we tend to use way too much of it. Itchy clothing, yep, when having dry skin itchy clothing could be even more itchy. Dry skin is especially sensitive to contact irritants, so continually exposing your skin to uncomfortable clothing could make your skin drier and itchier. Medications and a number of medicines have the side effect of drying out the skin. They include drugs for High blood pressure, diuretics, Antihistamines, etc. Sometimes dry skin can be caused by a medical condition such as: eczema and psoriasis, diabetes, hypothyroidism and malnutrition. Red or flaky patches, peeled and cracked skin, itchy skin. The best way to treat and also prevent dry, cracked skin on your feet is to use therapeutic ointments and creams (avoid alcohol products). Use a pumice stone or sand stone to file the hard dry skin, allowing the moisturizers to better penetrate the skin. Other treatments would imply wearing comfortable shoes, using night-time creams, checking your shoes for tight spots and areas that rub and using correcting insoles to eliminate points of friction. Other names for corns and callus are hyperkeratosis, clavus, heloma and tyloma. Corns and callus are one of the most common problems seen by Podiatrists. To have a corn or means that the skin has thickened in response to pressure. A callus generally refers to a more diffuse thickening of the skin. They are actually a normal and natural way for the body to protect itself from pressure. – toe deformities, such as hammer toes. – bio-mechanical or gait abnormalities that cause pressure under different areas of the bottom surface of the foot (this is a common cause of callus). Remedies such as corn paint, cure or plasters will generally only treat the symptom of the corn and not the problem that causes it. Sometimes wearing shoes that fit better or using special pads solves the problem. – following the advice of a Podiatrist. – proper fitting of footwear. – proper foot hygiene and the use of emollients to keep the skin in good condition. – Avoid walking barefoot in locker rooms, pools, gyms, and most other public areas. – Use protective slippers or sandals in public areas. – Avoid direct contact with warts from yourself with other body parts or from other people. – Keep your feet clean and dry. – Seek professional evaluation and assistance with the treatment of your warts if they have persisted, cause pain, or spread. – Diabetics and other patients with circulatory, immunological or neurological problems should not self-treat their warts. – Warts may spread and are catching. Make sure you have your warts evaluated to protect yourself and those close to you. A bunion is a bony swelling at the base joint of the big toe. 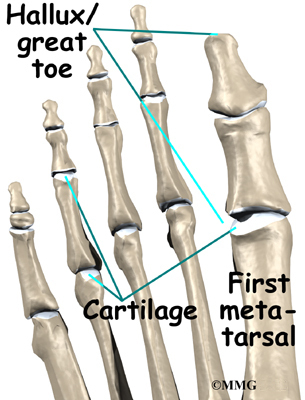 It causes the big toe to be angled inwards, towards the second toe. The skin and tissue on the bump of the bunion can become inflamed, swollen, and painful. Bunions can be related to inflammation or to degenerative disease and they run in families. Women are more likely than men to get bunions because of the misshapen footwear and elevated heels they wear. Bunions are one of the most common foot problems. They often run in families, which suggests that the inherited shape of the foot may predispose people to them. Producing a bunion also could be attributed to Flat feet when your body weight is repeatedly transferred to the hallux while walking, this transfer of weight allows certain muscles to become stronger than others. This overpowering of muscles causes the toe to bend and deform. An acute bunion can progress into the second type of bunion, the hallux valgus, a chronic but often painless deformity involving permanent rigidity of the bones. A frequent symptom is pain in the involved area when walking or wearing shoes that is relieved by resting. Bunions that cause marked pain are often associated with swelling of the soft tissues, redness, and local tenderness. If abnormal pronation is identified and corrected early, the formation of a bunion can be prevented, if not surgery will be necessary. Ingrown toenails occur when a piece of the nail breaks the skin. The corner of the nail curves down into the skin. An ingrown toenail can be painful and lead to infection. – Tight-fitting shoes or high heels cause the toes to be compressed together and pressures the nail to grow abnormally. – Improper trimming of toenails can cause the corners of the nail to dig into the skin. Nails should be trimmed straight across, not rounded. – Disorders such as fungal infections of the nail can cause a thickened or widened toenail to develop. – Injury near the nail may cause an ingrown toenail. – If a member of your family has an ingrown toenail, then you are more likely to develop one too. – Early in the course of an ingrown toenail, the end of the toe becomes reddened and painful with mild swelling. There is no pus or drainage. – Once an infection has developed, the swelling will become worse, and there may be white or yellow colored drainage from the area. A lighter colored area of the skin may be surrounded by red skin. You may develop a fever, although this is unusual. The best method of prevention is careful clipping of the toenails straight across, taking care to keep the end longer than the skin edge. This prevents the corners from digging into the skin. They should not be rounded or cut too short. Wearing well-fitting shoes. Keeping your feet clean and dry. – Some people are just structurally prone to develop hammer toes (hereditary). – Tight footwear is an important factor in the cause of hammer toes as well as providing the pressure that causes the symptoms. – Weaker small muscles in the foot may also play a role. – It´s important that any footwear advice is followed. The correct amount of space in the toe box will allow room for the toes to function without excessive pressure. We recommend you to ask for a proper fitting chart in your shoe store or to check online. – If a corn is present, this will need to be treated. – If the toe is still flexible, it may be possible to use splints or tape to try and correct the toe. Without correct fitting footwear, this is often unsuccessful. – Padding is often used to get pressure off the toe to help the symptoms. – If conservative treatment is unsuccessful at helping the symptoms, surgery is often a good option. A bony spur projecting from the back or underside of the heel bone that often makes walking painful. A calcaneal spur is also called a Heel Spur. The heel bone is the largest bone in the foot and absorbs the most amount of shock and pressure. Heel spurs develop as an abnormal growth in the heel bone due to calcium deposits that form when the plantar fascia pulls away from the heel. Women have a significantly higher incidence of heel spurs due to the types of footwear often worn on a regular basis (High Heels). People with unusually high arches can also develop heel spurs. The calcaneal spur is seen most often in persons over the age of 40. The condition can also be associated with osteoarthritis, poor blood circulation and arthritis. Although it may take years to become a problem, once it appears, it may cause considerable suffering. The sensation has been described as “a toothache in the foot.” When you place your weight on the heel, the pain can be sufficient to immobilize you. To proper treatment heel spurs, first we have to determine what is causing the excessive stretching of the plantar fascia. If the cause is flat feet, treatment could be a device to reduce the over-pronation, and allow the condition to heal. Other treatments for reducing spurs could be, stretching exercises, losing weight, wearing shoes that have a cushioned heel that absorbs shock, and elevating the heel with the use of a heel cradle, heel cup. In this article we have talk about the most common foot problems, sorry for not showing pictures but I feel it could be a little bit disgusting and I actually want people to read my posts and not to run away from them. This entry was posted on May 12, 2008 at 4:47 pm and is filed under Foot Health, Help & Advice. You can follow any responses to this entry through the RSS 2.0 feed. You can leave a response, or trackback from your own site. Understated says : I absolutely agree with this ! Howdy, I found your interesting site on Bing. Bunion problems are close to my heart. Every weekend i used to pay a quick visit this web site, because i want enjoyment, for the reason that this this website conations actually fastidious funny data too. In this case, pressure is usually felt mostly in the lumbar area (lower back) and over time, this will result in excruciating pain.